The Scottish Football Association is suing former Rangers owner Craig Whyte over a £200,000 unpaid fine for bringing the game into disrepute. Whyte, who was banned for life from any involvement in Scottish football, has ignored requests to pay the penalty that was imposed in April. He had failed to notify the SFA that he had been disqualified as a director for seven years in 2000. The 41-year-old is considering counter-suing the SFA. He was initially fined £50,000 by the governing body, with three identical penalties added. The additional fines were for separate counts of failing to follow directions from an SFA tribunal, while a charge of acting in an improper manner and against the interests of football was not proven. At the time of the verdict, Whyte dismissed the fine as "a joke" and said any notion of him being impelled to pay up was "farcical". And he has previously suggested taking legal action against the SFA on the issue. 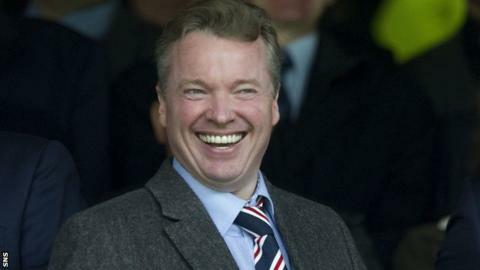 Whyte bought Rangers from Sir David Murray for just £1 in May 2011 and was at the helm when the club plunged into administration almost a year ago.